This fantastic 1.2 AOTA CEU (12 Contact Hour) AOTA approved provider (NBCOT® 15 contact hour) movie course will challenge your clinical skills. Paul Bonzani MOTR, CHT is an extraordinary instructor taking you from occupation functional concepts/approcahes, to anatomical considerations, to soft tissue pathology to neuroanotomy and biomechanics. 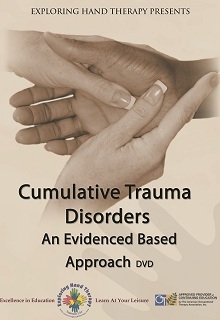 The instructor discusses common and not so common cumulative trauma disorders or repetitive strain disorders from the shoulder to the finger. Evidenced and occupation based approach to quantify implementation for CTDs. 117 page full color manual included with FAQ, photos, PP, and references.Instructional Methods include PowerPoint presentation, lecture, videos to enhance understanding . Upon successful completion of the examination (80%) your certificate will be sent via email. Mixed level course. packed with useful information. Presenter was excellent. Outstanding - I couldn't stop watching it! The information was well presented and immediately applicable in the clinic. I highly recommend it. I'm incredibly happy with my course and the assistance I received when signing up for it. My only downfall was being unable to print the manual therefore I have minimal to no notes available to reference back to.